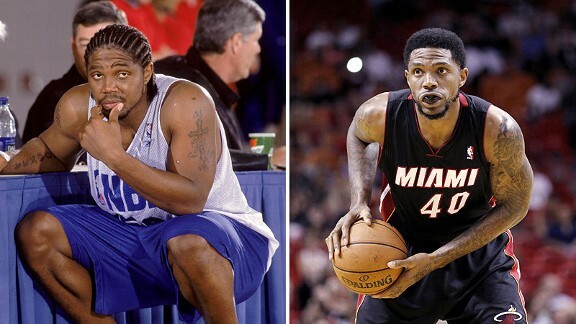 Once a 300-pound, undrafted player who couldn't rebound, Udonis Haslem is about to make history. MIAMI -- On Wednesday night against the Milwaukee Bucks, Udonis Haslem will likely surpass Heat legend Alonzo Mourning as the franchise’s all-time leading rebounder. All Haslem needs is two rebounds. Haslem has pulled down 4,806 rebounds in a Heat uniform while Mourning hauled in 4,807 during his tenure for the team. How does a guy who’s generously listed at 6-foot-8 and 230 pounds become the rebounding champion of an NBA franchise that has existed for decades? That’s the question I posed to three men whom collectively have coached Haslem since he was a teenager. Frank Martin -- Haslem’s former high school coach at Miami Senior High School and current head coach of the University of South Carolina. Martin won the Big 12 Coach of the Year award in 2010 while at Kansas State. Haslem won two Florida state championships under Martin. David Thorpe -- ESPN.com Insider, NBA scout and executive director of the Pro Training Center, a workout haven for NBA players and aspiring NBA players alike. Thorpe is often credited as the coach who turned Haslem’s potential as an NBA player into a reality by teaching him his patented jump shot and the value of rebounding. Erik Spoelstra -- current Heat head coach and the longest-tenured coach of Haslem’s NBA career. Here are the stories they told to help us understand how a player of Haslem’s size can stand so tall in NBA history. There are hometown heroes and then there is Udonis Haslem. To understand Haslem, you must first understand where he came from. In June of 1980, he was born in a hospital seven miles from the Heat’s AmericanAirlines Arena. He grew up in the heart of Miami in an area called Liberty City, widely considered the most crime-ridden and bloodiest six square miles inside Miami’s city limits. That’s where Haslem was raised, where he was hardened. After a brief stint up the road in Jacksonville, Fla., he moved back to South Florida to attend Miami Senior high school, a basketball powerhouse with a national reputation. That’s where he played for Martin and won two state titles in 1997 and 1998 alongside Los Angeles Lakers point guard Steve Blake. Martin speaks of Haslem like Haslem was his son. It was at Miami Senior where the seeds of Haslem’s hard loyalty and relentlessness were planted. Heavily recruited out of high school, Haslem went to the University of Florida to follow Wright, his closest pal. After four years at Florida, Haslem left as the winningest player in the school’s history, earning a trip to the NCAA championship and a spot on the All-America squad. In 2003, the Miami Heat offered him a training camp invite and Haslem hasn't left Miami since. When people ask where Haslem got his toughness, he mentions those three digits. But as Haslem learned the hard way, toughness was nothing without work ethic. The story of Haslem is an unlikely one. Not only did he rise out of the humblest of settings, he was shunned by every team in the NBA out of college, despite his long line of championship appearances and personal accolades. He went undrafted in 2002. His reputation? Too short. Out of shape. Couldn’t rebound. It was Thorpe’s job to change that. As a young assistant high school coach in Florida during his early 20s, Thorpe had known about Haslem ever since he was in high school. It was hard not to. High school Haslem looked nothing like he does now. As a 16-year-old senior, Haslem was big -- about 6-8 and 300 pounds big. Martin and Thorpe crossed paths at numerous basketball camps in the state. At one particular camp, Thorpe vividly remembers the first thing Martin told him about Haslem. After Haslem failed to get drafted, he spent a season in France playing for Chalon-Sur-Saone. When he arrived on French soil, he was pushing 300 pounds. But while there, he stopped working out, ate only one meal a day and only McDonald’s because he abhorred the local food. Thorpe recalls the first time he saw Haslem after he briefly returned from France to attend a Gators football game. Haslem had lost 50 pounds in eight months. Haslem, as it turned out, did not have cancer; he just lost his appetite for French cuisine. But he was so “bone thin” that Thorpe hardly recognized him. Spoelstra had a similar experience months later when Haslem showed up for a Heat workout. Haslem put in countless hours of hard work to earn the chance to stun Spoelstra at that Heat workout. Two more boards and Haslem will become the only undrafted player to lead an NBA franchise in total rebounds. Only Moses Malone, Ben Wallace and Brad Miller have more rebounds after being passed up on draft day. With a delayed start to his career, Haslem has the third most rebounds in the entire 2002 draft class, a class he was technically never a part of. How did Haslem go from undrafted player who couldn’t rebound to one of the game’s best rebounders? It started with an overly inflated basketball. Thorpe began working out with Haslem in 2003 when the former Gators All-American came back from that season in France. Haslem’s then-agent and now current part-owner of the Memphis Grizzlies, Jason Levien, entrusted Thorpe to mold Haslem into an NBA player. Thorpe remembers telling Haslem on the first day of workouts: You’ll make the NBA with your rebounding, but you'll get paid with your shot. But first things first, Haslem had to learn how to rebound. So Thorpe decided to pump so much air into a basketball that it could barely sit still. With this ultra-bouncy ball in hand, Thorpe walked out to the center of his gym in Clearwater, Fla., and began chucking it as hard as he could at the basket. Haslem’s task? Recover the ball before it hit the ground. “He would chase after those rebounds all the way to half court like it was a gold medal,” Thorpe said. Although it seemed painfully cruel at the time, Haslem needed it. Thorpe understood that Haslem needed to learn that every ball was his, no matter where it landed. He needed that drive. And after being tossed to the curb by NBA execs, Haslem was hungry to find it. Sitting after Tuesday’s Heat practice with beads of sweat dropping off his head, Haslem was reminded of that bout with the bouncy basketball. No, he wasn’t too fond of it at the time. Haslem was one of several NBA prospects that Thorpe trained that summer. Oklahoma City Thunder guard Kevin Martin, the recently waived Josh Powell and Haslem were trying to make a career in the NBA. After a hard training session, the exhausted group went out to a local Greek restaurant near Thorpe’s gym. Haslem wasn’t in the brightest of moods. Powell had essentially posterized Haslem just hours before, snatching a live ball from Haslem’s grasp after a missed shot and dunking the putback on Haslem, all in one motion. Thorpe sat down alone at a table with his plate of gyros and a blob of tzatziki. Haslem pulled up a chair and sat down next to his coach. After weeks of working with Thorpe, Haslem impressed enough people in Miami’s front office to earn a training camp invite. Armed with added muscle, a reliable jump shot and a top-five ranking in rebounding at Summer League, Haslem played so hard during his first practices with the Heat that the coaching staff was legitimately worried about the safety and well-being of Haslem’s teammates. So a coaches meeting was held to decide whether to let Haslem play with Dwyane Wade, Caron Butler and current NFLer Tony Gonzalez. Yes, Haslem may have been too rough with a future Hall of Fame tight end. A few weeks later, Haslem emerged as the starter for the hometown Miami Heat in the team’s season opener. That was also his NBA debut. Finally, it was happening for Haslem. That was the player Thorpe wanted Haslem to emulate. At 6-9, Wallace had just led the league in rebounding for the second season in a row, just seven years removed from being undrafted just like Haslem. When it came to rebounding, Thorpe wanted Haslem to use his toughness to turn 50-50 balls into 80-20 balls and 80-20 balls into 100-to-zero balls. Just like Wallace did. Five years after Thorpe gave Haslem that poster, the coach received a phone call one summer evening. After no NBA team wanted him out of college and fighting through numerous foot injuries, Haslem is now the captain of the defending champions and two rebounds away from being his hometown team’s all-time leading rebounder. He’s worked hard for this moment and you can be sure that his long line of coaches could not be more proud of the kid who couldn't rebound. It’s impossible for Spoelstra to say three words about Haslem without first uttering the word “toughness.” Same goes for Martin and Thorpe. Spoelstra says that when people ask what the Heat organization is all about, he just points to a picture of Haslem. Haslem should pass Mourning on Wednesday night on the Heat’s rebounding leaderboard in front of his home crowd in Miami. If you look at the list of the highest rebound rates in NBA history, the 6-8 Haslem ranks right next to the 7-2 Kareem Abdul-Jabbar. Through it all, Haslem continues to rebound. “At 16 years old, coming out of Liberty City,” Spoelstra said, “who would’ve thunk it?"